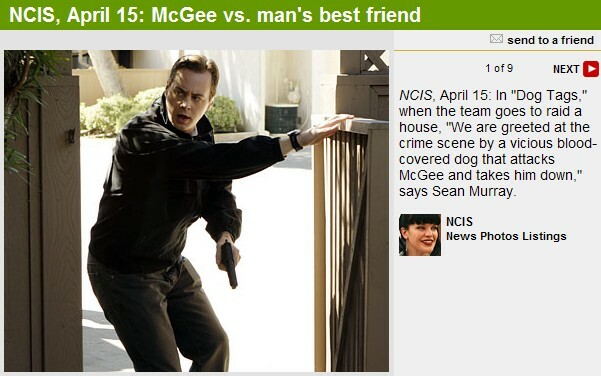 When the team goes to raid a house, "We are greeted at the crime scene by a vicious blood-covered dog that attacks McGee and takes him down," says Sean Murray. 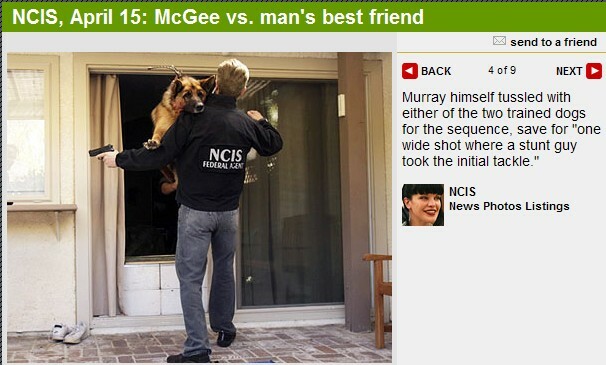 "I wasn't nervous at all," says Murray, who worked with two trained dogs named Rock and Rowdy. "I'm an animal person, and the dogs were pros. We could all learn from the dogs about professionalism on a set!" Murray's left arm was carefully swathed to protect from accidental bites. "You've got 700 lbs. of pressure there," he says, "and you don't want them puncturing the skin." 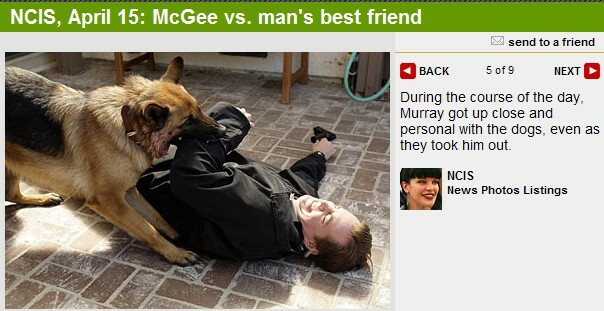 Murray himself tussled with either of the two trained dogs for the sequence, save for "one wide shot where a stunt guy took the initial tackle." 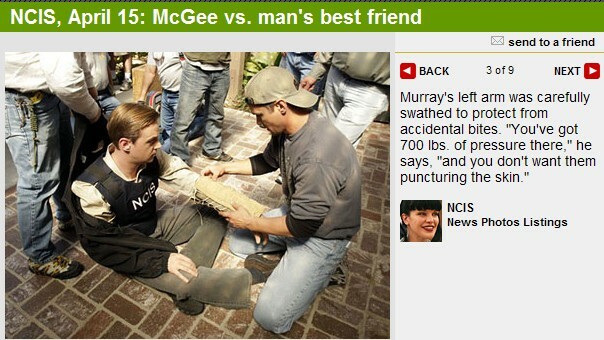 During the course of the day, Murray got up close and personal with the dogs, even as they took him out. 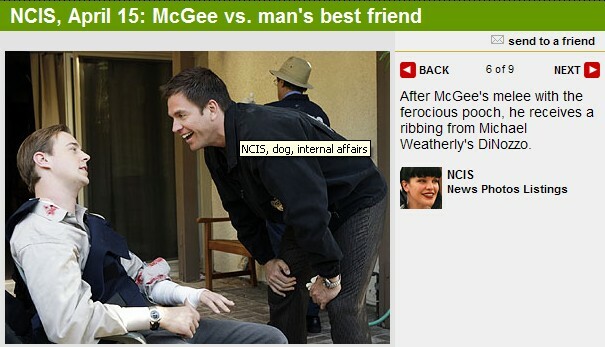 After McGee's melee with the ferocious pooch, he receives a ribbing from Michael Weatherly's DiNozzo. 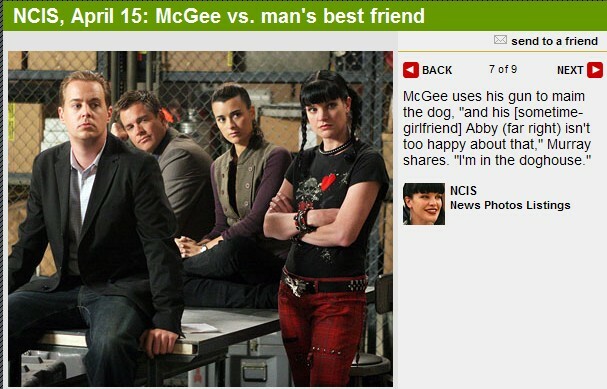 McGee uses his gun to maim the dog, "and his [sometime-girlfriend] Abby (far right) isn't too happy about that," Murray shares. "I'm in the doghouse." 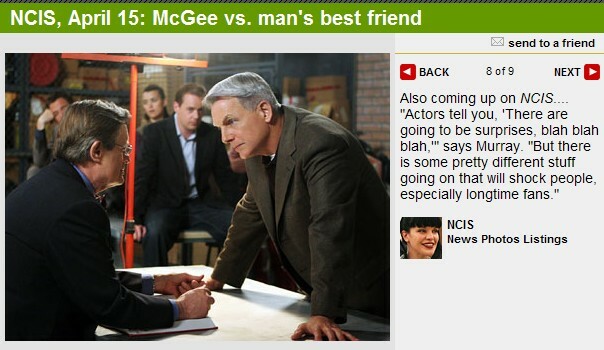 Also coming up on NCIS.... "Actors tell you, 'There are going to be surprises, blah blah blah,'" says Murray. "But there is some pretty different stuff going on that will shock people, especially longtime fans."